As a founder member of the Edge Hill University Poetry and Poetics Research Group (PPRG) I was used to the outstanding organising skills of Robert Sheppard. 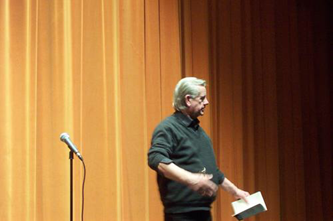 In his time at the University, Sheppard brought a host of important poets to read, talk to students or to present at open meetings of the PPRG. Poets who visited included Tom Raworth, Lee Harwood, Harriet Tarlo, Geraldine Monk, Jerome Rothenberg, and John James. I became aware of John’s work through Sheppard calling him ‘the Welsh O’Hara’ around the time of the publication of the wonderful John James Collected Poems published in 2002, by Salt. This book gathered all of the work from 1967’s Mmm Ah Yes through to Schlegel Eats a Bagel (1996). Because of the rarity of the work in pamphlet form contained within, it was a real gift to have these poems readily available. 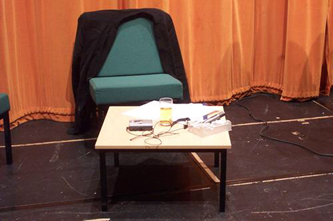 John James read his work at Edge Hill on 23rd November 2005. It was a mesmerising reading. Robert Sheppard has proof of this on a cassette tape that he recorded that night. Following the publication of Collected Poems, precious few John James poems appeared in print, whilst odd bits of criticism about the work appeared in places such as Poetry Wales and in 2009, ‘An Introduction to John James’ by Peter Philpott appeared on the Modernpoetry.org.uk website (the page is still active.) The Salt Companion to John James edited by Simon Perril, was published in 2010, featuring essays by John Wilkinson, Romana Huk and John Hall, amongst others. It wasn’t until 2011, that a new pamphlet of poetry emerged. In Romsey Town was published by Cambridge Press, Equipage. A beautifully produced collection of exquisite James poetry, it was a delight and a wonder to behold and it was thrilling to be in the company of contemporary James work. Following swiftly in 2012 came Cloud Breaking Sun (Old Hunstanton: Oystercatcher Press), a pamphlet whose poems were described by Alastair Paterson in Stride Magazine as retrospectives of travels and visitations, of old friends and vanished times, [are] undertaken with an exemplary calm and kindness. […] Lives where poetry was and had to be the centre are touched on, re-animated. Peter Riley writing in The Fortnightly Review of Songs in Midwinter for Franco, noted 'that we only have a small sample of John James' poetry before us' adding that that 'since his Collected Poems of 2002 he has published only an Oystercatcher Press pamphlet and In Romsey Town (Equipage 2011) which is half-way to a book at 40 pages.' Riley was probably as surprised as anyone when a further Oystercatcher pamphlet, Sabots followed in 2015. I sent off for ‘Nightmare.’ I was pleased to receive a A4 stapled four page mimeographed item with a hand drawn cover image. The poem can be dated to specifically, as on the final page interior we have the dates December 1970 – April 1971. Cambridge poet and editor of Oystercatcher Press, Peter Hughes wrote to me and made me aware through his role as a Judith E. Wilson Poetry Fellow at Cambridge university and visiting Fellow at Magdalene College, that he was organising a symposium focussing on the work of John James. We corresponded about my recent acquisition of a hitherto missing James poem, and Peter invited me to present a paper at the symposium. Andrew Taylor and Geoff Ward. John was in attendance throughout the day and afterwards accompanied some of the panelists and delegates to a nearby pub, The Punter. it was a pleasure to be in John’s company, as he talked happily about his French home and kindly signed copies of his books and pamphlets. John asked for a copy of ‘Nightmare’ and confirmed via email that it was indeed a lost poem. I continued my correspondence with John following the conference and was delighted to receive a postcard thanking me for sending him a copy of my second book of poetry, in late 2017. Similarly, I was touched and humbled to receive an acknowledgement for ‘discovering the fugitive poem ‘Nightmare’’, in John’s New & Selected Poems Sarments, published in April 2018 by Shearsman. British poetry has lost one of its greats.